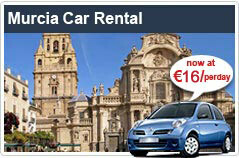 Murcia Airport Car Rental enjoys friendly tie-ups with some of the most eminent rental suppliers in Murcia. Part of VIP Cars, a leading broker firm, Murcia Airport Car Rental provides travelers with fine rental deals at most competitive prices. We, at Murcia Airport Car Rental, work with best rental brands to present exclusive deals and discounts for Murcia Airport and various nearby locations. Easy booking, online booking amendments, 24/7 customer support for booking related queries, wide fleet of cars and trusted network of suppliers are few reasons to rent a car at Murcia Airport with us. We also present various pick up and drop off locations to choose from, including other key cities in and around Murcia. Whether you are on a vacation or have a business trip planned, we present a fleet of both economical and high end cars to suit your rental requirements. Get best of rental deals for Murcia Airport with us now!